"Loewe of the Haymarket. From the British Empire and beyond, Pipemen of yore recognized the name and place where the finest pipes were made. Who was Loewe, and what and where was the Haymarket?" 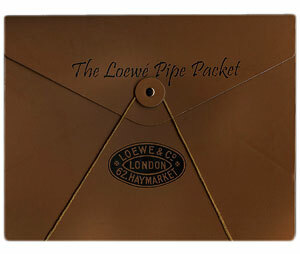 Thus begins the introductory booklet to the Loewe Pipe Packet - yes, it does indeed have a 22 page booklet to serve as a preamble; an appetizer, if you will, to the main course. Alleged to have been both the first to make briar pipes on English soil, and to be the originator of some of the very names by which we call some of the most classic forms (as Loewe used names rather than numbers to identify different shapes), Loewe & Co. was undoubtedly one of the major influences upon the very rudiments of how we define, speak of, and even think of pipes to this day. Included in the finely presented packet are reprints of the Loewe No. 7 (1910) and No. 9 (1926)catalogs, a reprint of their 70 year anniversary brochure, a portfolio of John Fabris' Loewe collection, and a print of the Loewe workshop as it was photographed on March 23 in the year 1910.